The Map is Not the Territory: Make Your Own Attributes Matching Game! Make Your Own Attributes Matching Game! I have had attributes on the brain for a couple weeks now. Most of my thinking has been on how the practice of identifying similarities and differences (a closed process) really opens up when put into a design context. So, given how much I've been thinking about it, it's no wonder that what I thought would be a ho-hum, pass the afternoon kind of game turned into an incredible brainstorm. The kid and I were playing a Blue's Clues matching game. I was, truth be told, not 100% engaged, but it was a pleasant enough way to pass some time. At some point I noticed that this particular matching game was really quite tricky. You'd turn over two cards with green dogs on them but they were different in some very tiny ways. Attributes! On the matching game (brilliant, brilliant, game designers)! What if we made our own? Could we make our own? "Do you wanna make our own matching game?" I asked the kid. Needless to say, the answer was yes. We rushed around the house trying to locate the 3"x5" cards but, of course, they were nowhere to be found. I rounded up some other paper, the paper cutter, some shapes to trace, and the crayon caddy. Geometric shapes only. This is (sneaky) math after all. We used tangram pieces, pattern blocks, some Cuisenaire rods, and some magnets from the fridge. Each pair of cards has to be exactly the same. It's never too early to experience congruence, and what better way to do that then to be personally responsible for it? This is a key point in my still-developing argument (one that is based on my experience with Math in Your Feet as well as what I've been doing lately) -- it's one thing to observe congruence, it's another to have to be congruent yourself. I realized as we went along that the 'make a game' energy really motivated my kid to do this part up right. She paid a lot of attention to sameness in her designs. 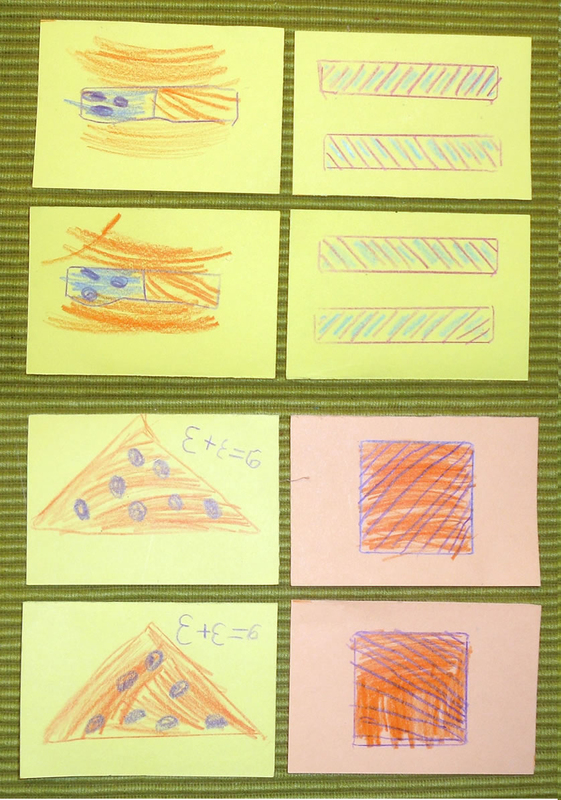 Each pair of cards have to be different from the other sets in some way. 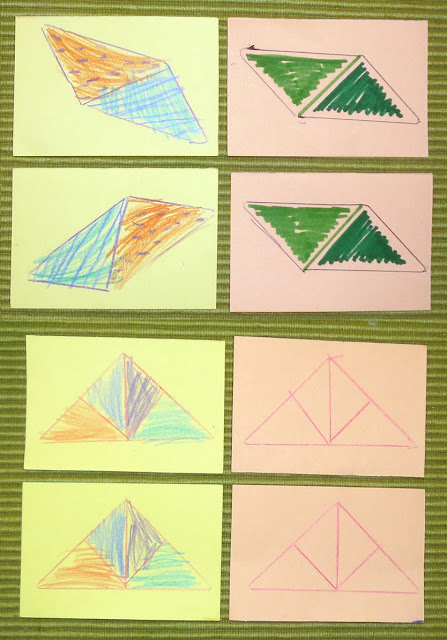 We have yet to explore this fully, but this means that if you make make more than one set of triangle cards, the sets have to be different from each other in color or design or size. It's this last point that created the most conversation as we created our cards together. According to the kid, I was altogether too boring in my designs. I would say, "But every design you make is colored in! They have to be different from each other, so I'm going to leave mine uncolored." This, apparently, motivated her to copy my 'boring' designs and make them 'more interesting' than mine! All told, and in very short order, our prototype set of matching cards totalled fourteen pairs, which made for a very satisfactory game. I'd love to find a calmer time to for us to work more slowly, carefully, and thoughtfully on another set. She wants to make sets of matching games to sell at her ever-evolving lemonade-origami-bookmark stand in the spring, which I think might be motivation enough to take a closer look at how to generate similarity and differences. If you end up making your own attribute matching game I would SO love to see what you create (please, please, please?!?). Malke, have you played Blink and Set? Blink has the players match one of 3 attributes (color, number, shape) to get rid of their cards. Set has players make sets of 3 where each of 4 attributes must either match on all 3 cards, or be different on all 3 cards. It's harder than Blink, but young kids can get it. I've made decks of set cards with kids. Figuring that out is a big challenge, and of course they choose their own pictures. The whole deck is 81 cards (and getting them to see why is some cool math). A deck with just 3 attributes (3 choices for each) would be 27 cards. The kids at Wildcat really enjoyed this project, and loved playing Set with their own cards. Oh, that's a great idea! Thanks for clarifying the other math part, the combinations. Wow! I've gotta try making something like that with the kid! I'm not sure if, at six, she's ready yet for that kind of structured thinking....? I'll have to see. This matching game idea, though, seems like it would make a good first step to 'make your own Set deck' activity you described. A little more freedom to explore, lots of right answers, lots of chances to have conversations about choices. Also, a chance to talk about congruence. :) As always, thanks for the conversation! Love this idea, Malke! I also love when the kids create the game. Gonna try to get "Set" going tomorrow afternoon. We'll see if we have any attribute match making game moments pop up. Have you ever played the card game Set? It's about attributes. I love your blog. Congradulations on the award. Moving Forward: The New 'Making Math' Page! Let's Play "How Much Change is in Mama's Purse!?"